Oct - 22 | By: Katherine Wilson | no comments. Oregon Film Veterans Katherine Wilson and Philip Krysl (with over 40 years as Oregon filmmakers and 50 Oregon Film Credits between them) mentored 10 students this last year from the U of O into the industry by helping the students produce the couples’ screenplay “Animal House of Blues”. The collaboration with the students began small as a short for credit in a NW Film Class, which then resulted in final projects and Career Center and Journalism Internships. Not wanting to stop there, Student Director/ Cinematographer/ Editor Jay Richardson was supported by the whole group of students from several classes over the summer to create a feature length Documentary and entered the Eugene International Film Festival August 17th, the day summer school ended. 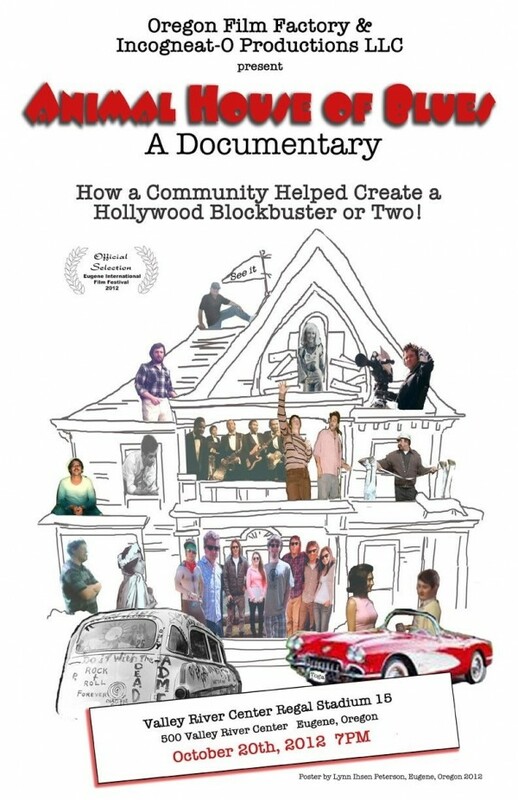 Officially selected by EIFF, and recruited by Sebastopol Documentary Film Festival, the students have completed a huge learning curve from Screenplay to Awards Ceremonies in a very short amount of time. Supported by friends at Indent Studios, and Retired Teacher Rocky Manos and his wife Shelley Kay Manos, the film had a huge attendance Saturday Night from all over Oregon. A-list Oregon film icons such as Lana Veenker, Bruce and Sherilyn Lawson (Sherilyn and former Studio Exec Kim Plant were also involved with the filming in 1977) and Indent’s Greg Skelton and Tim Whitcomb were in attendance as well. A parade of vehicles followed a Yellow and Blue Sailbus to the Premiere with Otis Day and the Knights songs playing from the top of the bus, as well as cast and crew in character-related costumes, soul patches and Raybans. At the awards ceremony, a stunned group of students celebrated as they won “Best Documentary Feature by a Pacific Northwest Filmmaker.” The Eugene International Film Festival is praised by outsiders and insiders alike, and is unique in that it also provided the students with intensive ‘Retreat’ Workshops one-on-one with key Hollywood industry professionals in the realms of Distribution, Literary Agents, and Screenplay Writing. Congratulations to everyone involved and as a prototype of future collaborations planned by Exec. Producer Rocky Ma’nos and Producer Katherine Wilson for the Future of Young Oregon Filmmakers.